Cast: Steven Strait, Camilla Belle, Cliff Curtis, other people you've never heard of. And Omar Sharif. Story: When ten tribes go to war. Take a hefty dose of Apocalypto, add a dash of 300, mix in some blockbusting special effects and you have 1 Million Years BC .... no hang on .... I mean 10,000 BC. No sign of Raquel Welch or even a furry bikini. Roland Emmerich, in case you don't recognise the name, directed such all-mouth-and-no-trousers hits as Independence Day, Godzilla and The Day After Tomorrow, so it will come as no surprise to you that 10,000 BC has excellent special effects, but struggles to maintain a plausible narrative. The story, for what it's worth, involves some nasty tribey men invading villages of nice tribey men and stealing a nice tribey woman. Nice tribey man heads off on a quest to get nice tribey woman back, while fighting off scary pointy beasties and the aforementioned nasty tribey men. Some of whom seem to have invented Mach 3 razors rather earlier than we had previously thought. Along his epic journey he escapes from snowy wastes into the convenient shelter of a nearby rain forest (clearly global warming was rather more severe back then) and lucks into meeting the only nice tribey guy who can fluently speak all the languages of all the nice tribey people within a thousand miles - though how he learned these languages is anyone's guess - I expect he stumbled across a nice tribey library in an underwater firepit. The attitudes of the characters are distinctly modern, whilst still maintaining a luddite and xenophobic storytelling style - these traits might have been swapped over for a more believable experience. 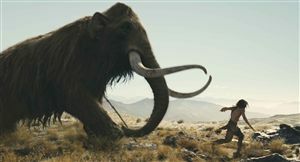 Still, the mammoths are good and you can successfully doze off until the next one lumbers along without missing anything important. 10,000 BC is archaically written with a rather sickeningly trite 21st century gravy dished on the top. It's worth catching for the ambitious effects but it won't touch your life in any way. A popcorn muncher. Testosterone Satisfaction Rating: 1/5 - Only one fit tribey chick and she gets whisked off pretty early on. Several battles with pointy sticks, but no blood. To enjoy this film you should: think about Raquel Welch during the boring bits. 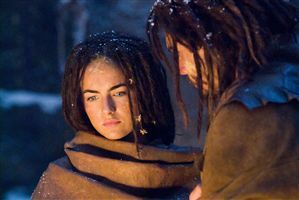 10,000 BC was released in the UK on 14th March 2008.